A new two bedroom bungalow with further sleeping accommodation in the living room. 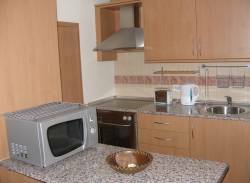 The bungalow is located at Correlejo (near �Baku� water park) and will easily sleep 5 in the property�s two bedrooms. 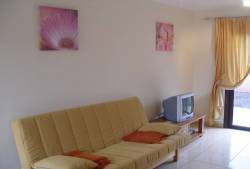 Further sleeping accommodation is available on one of the two double bed setteess in the living room. 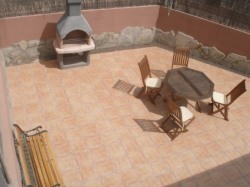 There is a spectacular 60m2 roof terrace solarium with views to Lanzarote and Las Lobos and the mountains. The solarium gets the sun from SUNRISE to SUNSET. There is also a private secluded rear patio with BBQ and awning. There is a private parking space. There is a communal pool and infant pool. There four reclining back sun loungers and an outside eating table with 4 chairs and a parasol. Discounts apply for two week lets.